There is a bus stop on the main road at the front of the Blue Serenity Complex. The buses run regularly between Kiti, Pervolia and Larnaca. 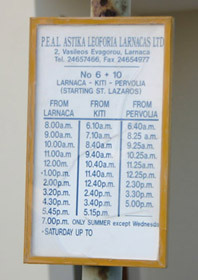 The bus numbers are 6 and 10 and start (and finish) by St. Lazaros in Larnaca, which is near the centre of the town and in easy walking distance to the shops, beach and restaurants. I’ve never personally used the buses in Cyprus so do not know the reliability or the prices so you may need to have a little bit of flexibility. I would suggest maybe turning up 15 minutes before they are due until you get your bearings.